If you'd like to read more, please follow the Facebook page! This is an incredible read. I cannot recommend it enough. Click here. When your personal gas tank is on empty, refilling it "just enough" to get from A-B, is not going to help. Refilling to a full tank is what is necessary to make your daily routine as smooth as possible. Check yourself against these 8 points and see.... how much of your tank is empty? Self-care starts with awareness.Click here. A person with Autism or an Autistic person? ​Are organizations using fear tactics to get the word out about Autism? Is it something that we should even look at as needing a "cure"? With the growing number of self-advocacy groups and individuals with Autism (I err on the side of caution vs. assumption, as I have many clients who prefer to be called "Autistic" and an equal number of clients who prefer to be referred to as an individual "with Autism") I think their voices need to be heard. Click here to read the perspective of individuals on the spectrum speak on a large-scale organization that advocates for Autism (or do they?). Read the comments at the bottom to get a greater glimpse of the opinions within the community. Click here. So what do genes have to do with Autism? Apparently… A LOT! View an interactive map that shows the specific chromosomes related to a variety of disorders and processes, click here. Not everyone discovers their Autism at an early age..
John Elder Robison, amazing guitarist. Click here for his story! This is a great diagram that describes some of the developmental markers indicative of Autism in infants and toddlers. Early detection and intervention is crucial. 22 habits of those that are unhappy. I thought this was a great read! Click here to read. A wonderful reply to those who feel we're "too quick" to diagnose. 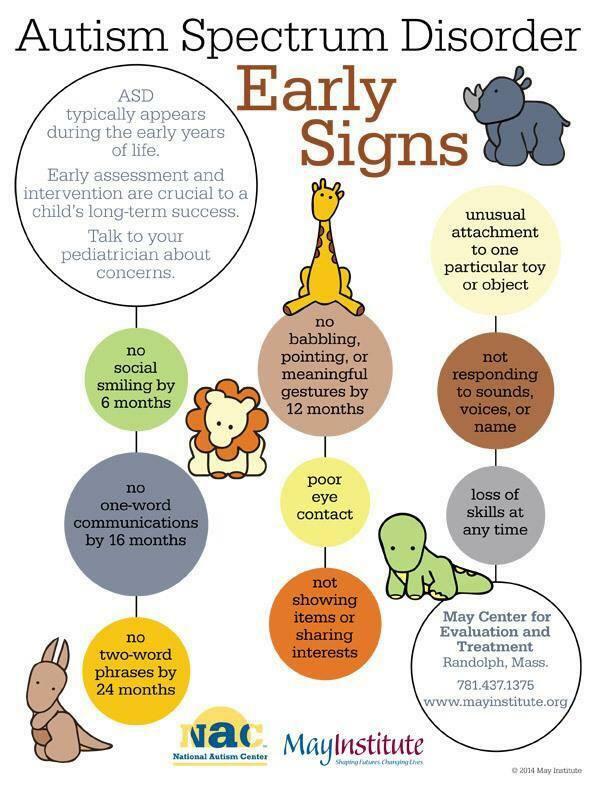 This response is spot-on about the importance of early intervention (i.e. scientifically proven to increase one's progress/chances at reaching milestones ) Click here to read. An interesting article written by Marc Chernoff that delves into behaviour patterns that can repel friendships. Read it through, do you recognize any of these patterns? Remember, patterns are not permanent - simply routines we create as habits to often protect, protest, and profess. Work through them and create healthier patterns for yourself. Click here to read. A wonderful story about Ryland and his parents - despite the hardships faced when going against societal "norms" decided to put their child's needs first. Watch the video here and see for yourself! What is your take on today's world? Are we too quick to believe because we "want" to believe in something, without the evidence? Are we far too focused on mindless entertainment than issues that are plaguing our communities? Read this article and then decide. Click here. It's an on-going discussion - but as a clinician, I cannot stress enough that there is NO link between vaccines and Autism. Here are some great articles/videos to help explain the zero-connection between vaccines and an Autism diagnosis. Learn how ABA in the school districts will enable us to meet the needs of each and every individual with Autism. More importantly, empower and educate yourself so you can advocate for your local school districts to employ ABA support workers. Click here. We need ABA Support Workers in ALL Districts! Bill Good supports our efforts. Listen to this radition discussion held on September 12th at 11am at CKNW with Bill Good. Click here. 21 Tips to keep your sh*t together when depressed. A frank discussion. Tired of all the things you need to do to be "happy?" when feeling low, or dealing with severe clinical depression? Read a list of 21 things to remember from someone who's going through the same. Sometimes it's not about being "happy" it's about surviving the best way you know how. Read it here! Rubina will be presenting at the 4th Annual BC-ABA Conference this weekend on March 3rd, 2012 on how to incorporate a CBT technique - Exposure Therapy, in an ABA designed program. For information regarding the conference please go here. Do you know a youth with special needs who is transitioning into adulthood? This may be an excellent resource for him/her. The Jewish Family Services agency is putting together a transition fair to help answer youth-specific questions, bring together resources, and provide an outlet for youth and service providers to engage in discussion. Check it out here. Written by Marc, and absolutely what you, me and the rest of the world needs to hear. It was a wonderful reminder, I'm feeling much better after having read it! Click here. Written by Jacob Sokol, a must read! You CAN be happy. Just try even one of these tips… read it here! Autism from the perspective of a loving parent. This video is quite moving. Lou a father of 3 children, made this video to share his story about his daughter. Watch it here. You can view Lou's blog here.